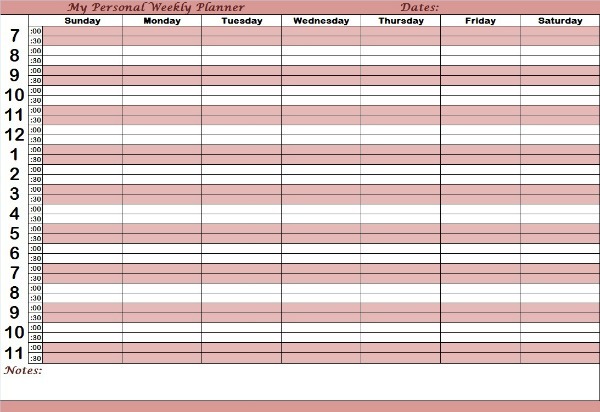 Printable planners are your useful tools for planning tasks in different situations and need for scheduling. We have available planners you can use for each day, per week, monthly, etc. You can arrange your schedule to your best advantage and avoid missing important tasks and responsibilities. From basic blank planners to advanced ones you can use each accordingly for your own convenience. Printing this daily planner will need a 8 ½" x 11" piece of paper or "Letter size." This is complete with the details and guide you need to plan your day from morning to night. 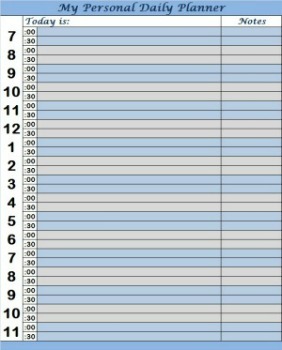 There are large numbers for this daily planner so you can monitor your tasks well according to time. Each hour of the day is divided into two 30 minute intervals. It has a notes section over the right side so you can write important details and adjustments related to your tasks that are significant for your planning. Using weekly planners can help you list all your tasks within the week. You can make adjustments in advance and arrange your activities where they would fit best according to your performance and circumstances. Weekly printable planners are similar to daily planners but they have the whole 7 days of the week for scheduling your tasks. It has days from Sunday to Saturday divided into columns with hours for each day labeled on the left side of this planner. The notes section is always significant so it is provided at the bottom of the planner. You should write the dates at the top right corner of this weekly planner first before using it. Monthly printable planners are your overview of monitoring the whole month of 30 days. You can mark important dates and write some notes about them. You should write the dates on the small boxes within each large box that a day represents. Printing this monthly planner will need a 8 ½" x 13" piece of paper or "Legal size." It may not be as detailed as daily planners and weekly planners for each whole day but it helps you to scan and have a quick glance of your events and schedules during the month. You'll be able to avoid forgetting appointments, meetings, etc. with this useful planner. Printable planners are useful in many ways as long as you do your best in following them and avoid skipping the tasks you have listed. Here are printable planners available for your calendar scheduling. This includes blank weekly calendars, blank monthly calendars and other types for different uses. Calendar planners may act like your typical calendar but much better. 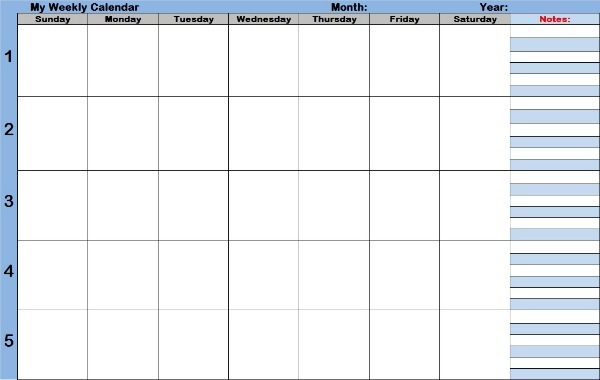 You can plan for 7 days of the week using blank weekly calendars and avoid missing important commitments and appointments. Weekly calendars are simple yet it can give you an overview of all your 4 weeks of the month. 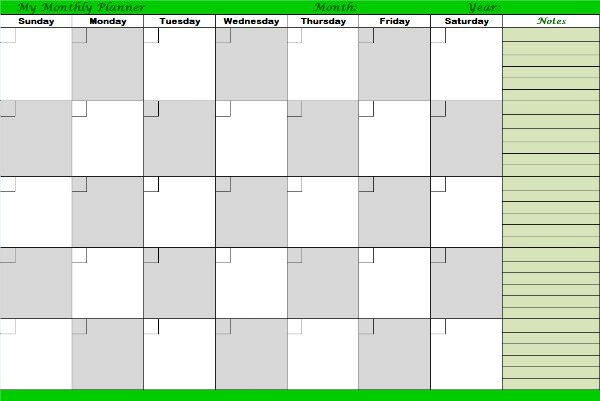 Printing this blank weekly calendar will need a 8 ½" x 13" piece of paper or "Legal size." Blank weekly calendars are designed with boxes representing each day from Sunday to Saturday with 5 rows for the 4 weeks of the month. This blank weekly calendar includes the notes section to write down details and reminders that you should not neglect in order to help you avoid certain problems during the week. Like the weekly planners it can serve like an advanced planner and enable you to adjust your events and obligations each week. Our printable planners would include blank monthly calendars. Blank monthly calendars can assist you in planning while setting your schedules for the whole month. Printing this monthly calendar will need a 8 ½" x 13" piece of paper or "Legal size." It may not be detailed per hour of the day but it gives you a "big picture" of your events for 28-31 days. It contains small boxes within each day where you can write dates according to the present month you're using this monthly calendar. 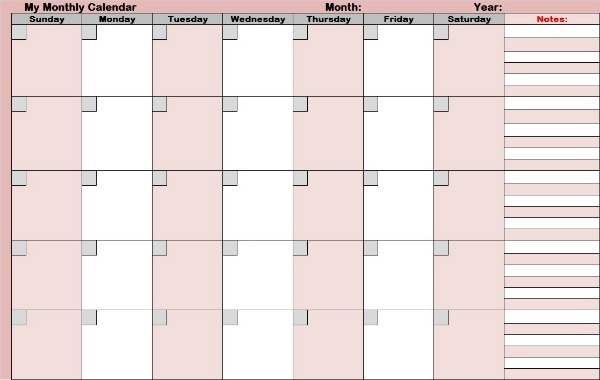 Blank monthly calendars have a format in which it can be used for any month of the year. You should write the present month and year at the top right part of the calendar to avoid confusion. Avoid unnecessary neglects and errors by using the notes section on the right side of the monthly calendar.